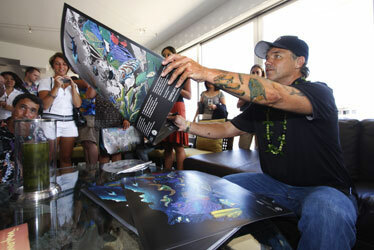 Marine-life artist Robert Wyland, who first began his quest to paint 100 gigantic marine-life murals 27 years ago, announced the 100th mural, which he will paint for the Olympic Games in Beijing, at a press conference yesterday at the Wyland Waikiki hotel, where he signed posters for everyone. Celebrated marine life artist Robert Wyland and San Diego-based eRealty Cos. are aggressively seeking to expand his contemporary, boutique hotel concept to the neighbor islands. The partners, which unveiled yesterday the artist's penthouse studio at the Wyland Waikiki hotel, have targeted Kauai's historic Coco Palms Resort as the ideal site to redevelop and open the first Wyland hotel on the neighbor islands. The Wyland Waikiki was the scene of much activity yesterday as the artist introduced two more of his latest projects: He is offering to design a license plate that could be used to raise funds to preserve Turtle Bay, and he plans to finish his 100th and final sea-life mural during the Olympic Games in Beijing. Marine artist and entrepreneur Robert Wyland interrupted his own news conference yesterday to talk about something even more pressing than his upcoming 100th - and last - gigantic "Whaling Wall" mural. The detour concerned license plates, and he pulled out a print of what he hopes will become a Hawaii license plate design. It shows a cute baby seal. Wyland, 51, said the design could help raise money to preserve the Turtle Bay area. "I have to talk to Gov. (Linda) Lingle about this," exclaimed the excited artist, waving the print. The license plate offer is due to a dust-up Wyland is having with the California Coastal Commission. More than a decade ago, in a handshake deal, Wyland agreed to allow the commission to sell Wyland license plates to raise money for marine education projects. Since then, however, Wyland says his own marine education foundation has received only token royalty payments from the state of California. Wyland said the specialty plate has raised more than $41 million. Last month, Wyland and his attorneys gave the organization a deadline to stop using the image. The commission announced it will continue using the painting of a whale's tail until a replacement is found. Local government officials were unsure at first how to respond. "The idea of this kind of fundraising is something the governor is open to," an official from Lingle's office said. "We're always looking for more ways to minimize government expenditures and maximize private contributions." The news conference, in the lobby of the Wyland Waikiki hotel - where the artist maintains a penthouse office-apartment - primarily concerned Wyland's last giant wall mural. Wyland, who made scaffolds and air guns his tools in painting 99 earlier enormous aquatic pastorales, will actually be overseeing a community effort this time. Children from the more than 200 nations competing in the Olympic Games in Beijing will paint 45-by-12-foot canvasses, each representing aquatic life in their homeland. "Oceans, rivers, ponds, streams, wetlands," explained Wyland. He plans to lean the huge canvasses against the Great Wall as part of an Olympic event. "It's an official cultural event of the 'green Olympics.' The event will be on a world stage, and it couldn't be a better time to do hands across the ocean for the environment. We need a sea change." He also talked about how art and science have to work together, and if "kids get involved, you can change the world. Scientists have to follow rules and artists break the rules." The project will be complete on July 21, Wyland said. On July 22, also in China, he will unveil the first work in his next artistic mission: to create 100 life-size sculptures of sea life.